← Enjoy your Labour Day Weekend! Fishing Point Park. St. Anthony is at the “Peak of Your Experience” on the Great Northern Peninsula with a host of walking trails, wildlife, nature, lighthouse, dining that includes (The Great Viking Feast & Light keeper’s Restaurant) and retail shopping that includes the largest selection of souvenirs on the Viking Trail at the Fishing Point Emporium. Rest awhile, and enjoy the surrounds of the coastline where you see fishing boats and glimpses of whales. During May to August the iceberg giants dominate the viewing vistas, as hoards of tourists flock to this space to enjoy many unique experiences the Great Northern Peninsula has to offer. After taking some of the natural walking trails or reading interpretative panels placed by St. Anthony Basin Resources Inc. (SABRI), you’ll want to stop into the Fishing Point Emporium, which has a unique Polar Bear display. It also has many panels depicting life in rural Northern Newfoundland & Labrador from re-settlement, mummering, whales, icebergs, fishing, Vikings, Dr. Grenfell, provincial symbols and everyday living. Shop and learn about the area at the Fishing Point Emporium and Interpretation Centre. 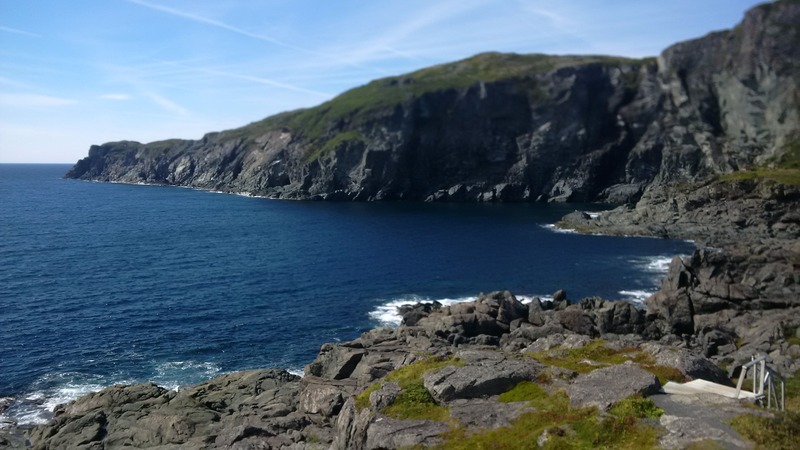 They have so many unique treasures from Viking swords, hand painted rocks, Newfoundland tartan pajamas, music, books and a host of other souvenirs and local crafts. Iceberg water is for sale there with a dairy bay and other light snacks. One of the photos above gives you a view from their window. It is just spectacular! There is a high speed internet cafe and WIFI readily available. The owners/operators exemplified customer service and knowledge of the area. They have a passion for this place! I encourage you to visit Fishing Point and all it has to offer. Support locally owned and operated small businesses in rural communities, they are a driving force to our economy. Posted on September 6, 2014, in Business, History, Landscapes/Geography and tagged Fishing Point, Great Northern Peninsula, Iceberg, Newfoundland, Polar bear, Restaurant, Rural, souvenir, St. Anthony, tourism, tradition, Trails, walking, Whale, wildlife. Bookmark the permalink. Leave a comment.